The glories of Baghdad during the reign of the ‘Abbasid Caliph Harun al-Rashid have been much celebrated and elaborated upon in the tales of the 1001 Nights, so his reign is generally identified with the great period of Baghdad's glories. Yet of the 23 solar years, 786-809 AD, of Harun's Caliphate, for 13 of those he reigned not from Baghdad, but from Raqqa on the Euphrates. Long before Raqqa served as the capital of ISIS' self-declared "Caliphate," it was the capital of the ‘Abbasids when they ruled most of the Islamic world (except Umayyad Spain). With the announcement today that Raqqa has fallen to the Syrian Democratic Forces (mainly the Kurdish YPG), it may be worth remembering Raqqa's previous glories. The Islamic State most likely chose Raqqa as its capital because it was one of the few cities it controlled, but it was surely aware of its role as a onetime Caliphal capital. In 796 AD, ten solar years into his Caliphate, Harun moved his administrative capital to Raqqa, though the state bureaucracy mostly remained in Baghdad. 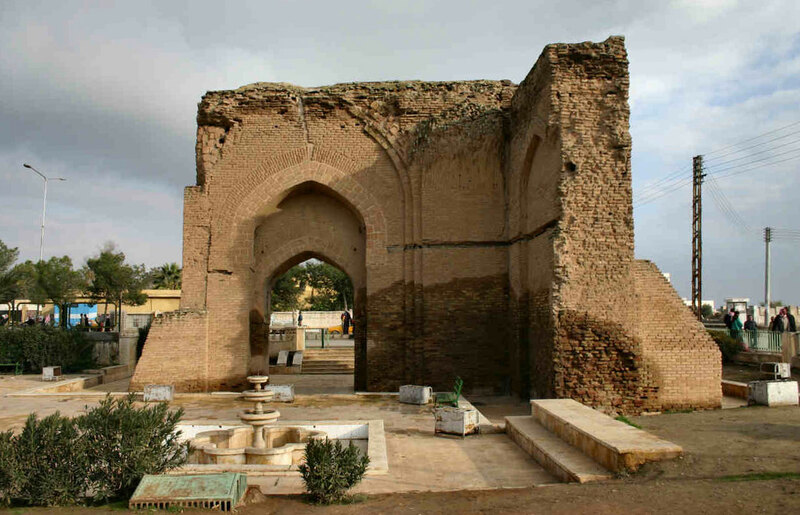 Many of the descriptions (mostly anachronistic) of the glories of Harun's Baghdad refer to Raqqa, where outside the view of the religious establishment and the Baghdad populace, Harun was more free to indulge his penchants for horse-racing, wine, and other pleasures. Some of the songs/poems in the Kitab al-Aghani refer to the pleasures of Harun's place at Raqqa. Not much remains of ‘Abbasid-era Raqqa, even before ISIS and the fight to retake the city. Some ancient walls and the Baghdad Gate at left, less whatever damage ISIS and the air and artillery assaults on the city may have destroyed.